Speaking as a physics student, it isn't one. Last edited by Sahan on Thu May 12, 2016 5:04 pm, edited 1 time in total. I think he's saying that chemists are never mentioned specifically, while other sciences (physics, biology, etc.) often are. Chemists are just glorified anthropologists. DonRetrasado wrote: Chemists are just glorified anthropologists. Which are no better than a swarm of parakeets. A mathematician works with basic shapes and theorems. A scientist suggests theorems and computes the probability of something being correct or not, and also where and when it is valid. An engineer likes to build large things that shoot out of large things just for the sake of creating something huge. A bioengineer takes the engineering mentality a step further with biological "creations". Basically each is a step further leading to bioengineering. The chemistry note is just an extra joke that has no relation to the actual comic. Zach probably added it so people don't ask why he did not mention it. It doesn't fit in the ladder to begin with. Guest wrote: I think he's saying that chemists are never mentioned specifically, while other sciences (physics, biology, etc.) often are. 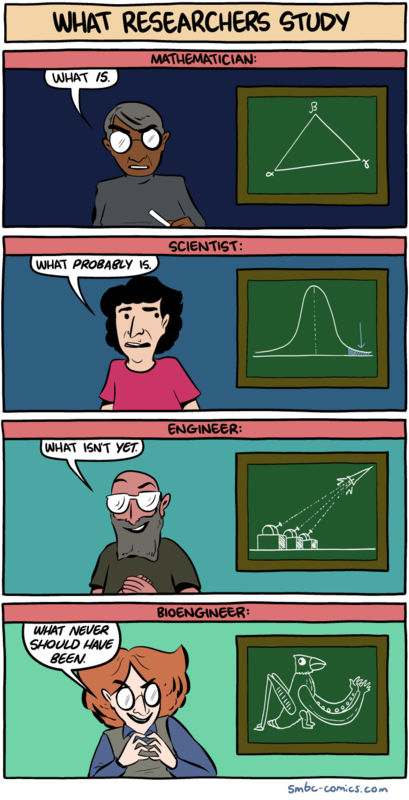 But no (natural) science is specifically mentioned in this particular comic.